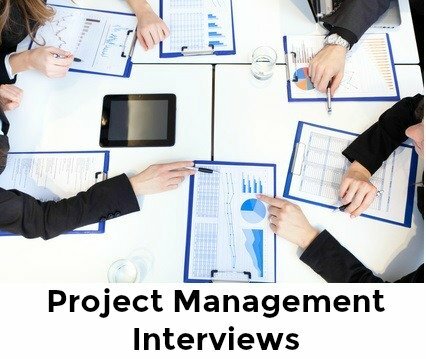 During the project management interview you will be asked interview questions that focus on your skills and experience in successfully delivering different projects. These typical project manager job interview questions explore the type of projects you have managed, the project teams you have supervised and the contribution you can bring to the job opportunity. Use the excellent sample interview answers as a guide to prepare your own winning answers and impress as the right job candidate. Tell us about your experience in managing different projects. How can this contribute to the position at this company? It is important to carefully structure your interview answer because this is a multi layered and fairly complex question. Start by explaining how you are going to answer the question. This keeps your answer on track and to the point. "I will begin by giving you a short description of my last three projects. I will detail the skills and abilities I developed as a result of each project and demonstrate the value of these skills to this position." You can then go on to provide a brief but concise summary of each project. "I was the project manager for the XYZ project and this involved ..."
Then describe the skills you acquired during the project. "I encountered a number of difficulties on this project that required an innovative approach. I used group problem solving sessions as one of these approaches. This worked well because it helped each team member to clarify their particular project role and responsibility and we were able to develop plans and realistic schedules that the whole project team contributed to ..."
Demonstrate how these skills will benefit the job and company. "Projects now are faced with tighter budgets and fewer resources. This approach maximizes the available resources and keeps everyone focused and motivated for the duration of the project..."
Describe how you recently managed a diverse project team towards a common goal. Outline your management style and why it worked. Describe the most complex project you have managed from start to finish. Provide a comprehensive answer remembering to explain the project as you would to an external client and not to somebody who has been involved in the project. Be enthusiastic about your accomplishments in your project management interview and specify how your experience will benefit the company. Point out where you made a difference on the project in terms of expenditure, quality, efficiency, customer satisfaction and business and organizational success. Your contribution should be clearly quantified to indicate your actual value to the project. How do you determine realistic schedules for the project? Explain your methods for resource allocation. How do you manage suppliers? How do you inform all the stakeholders of the progress of the project on a regular basis? How do you monitor risks to the project and mitigate them? What tools do you use to monitor and control projects? What project software have you used? What change management processes have you used to ensure that change is introduced properly? What are the practices you follow for closing a project and meeting the conditions required to establish closure? How would you describe your project management skills? Most project management candidates handle the questions designed to evaluate their technical proficiency well but tend to slip up on the project management interview questions that explore the behaviors or competencies required for a project manager position. Behaviors or competencies are important because over 80 percent of candidates lose the job offer due to their inability to demonstrate the required job-related behaviors. View the sample behavioral interview questions you are likely to face in your project manager interview with behavioral interview answer guidelines. Answer your project management interview questions in a calm and assertive tone. Take time to gather your thoughts before answering, it is a key project manager skill to be able to process the facts before responding!